"* command with numbers, delimited by spaces." response = "Sure...write some more code then I can do that!" The Slack Real Time Messaging API is an events firehose. 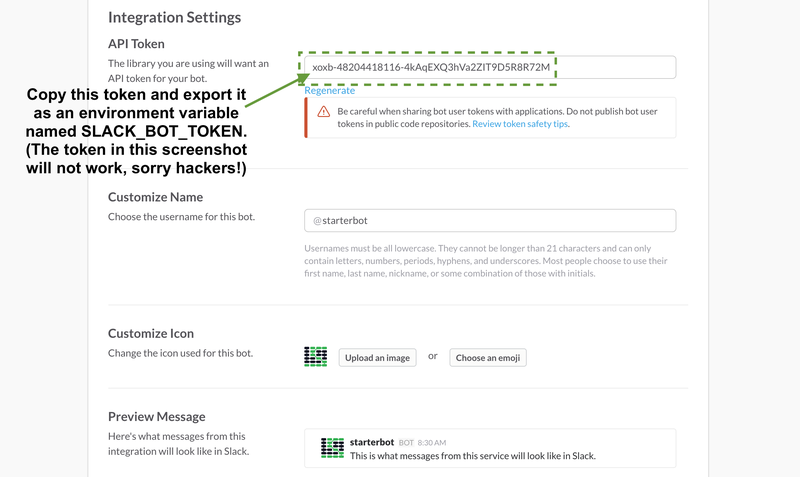 parse_slack_output 函数从 Slack 接受信息，并且如果它们是发给我们的 StarterBot 时会作出判断。消息以一个给我们的聊天机器人 ID 的直接命令开始，然后交由我们的代码处理。目前只是通过 Slack 管道发布一个消息回去告诉用户去多写一些 Python 代码!